The attic fire was extinguished, but the firefighters poked holes in the ceiling as part of their efforts. The wet, blackened insulation needed bagging by SERVPRO crew members to isolate the mess as we discarded the debris, from the rest of the house. 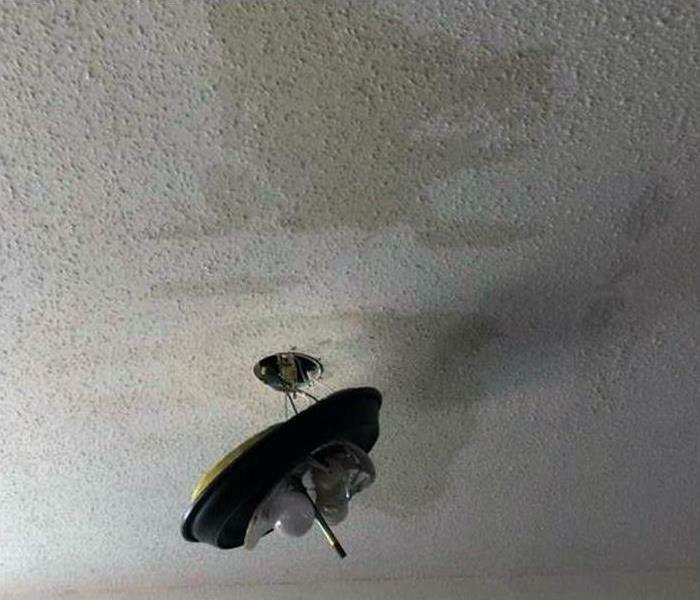 Don't let your Gage Park home fall victim to water damage. Our team is ready 24/7, locally owned and operated, and Faster to Any Size Disaster. We are IICRC certified in water restoration. 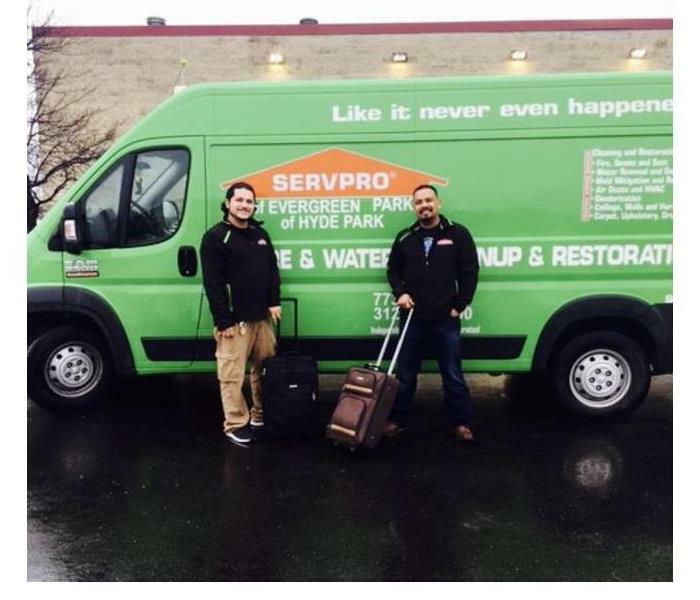 SERVPRO of Marquette Park / West Lawn / Ford City has the certified personnel, advanced training, state-of-the-art equipment, and water damage experience to restore your Gage Park home to pre-damage condition. 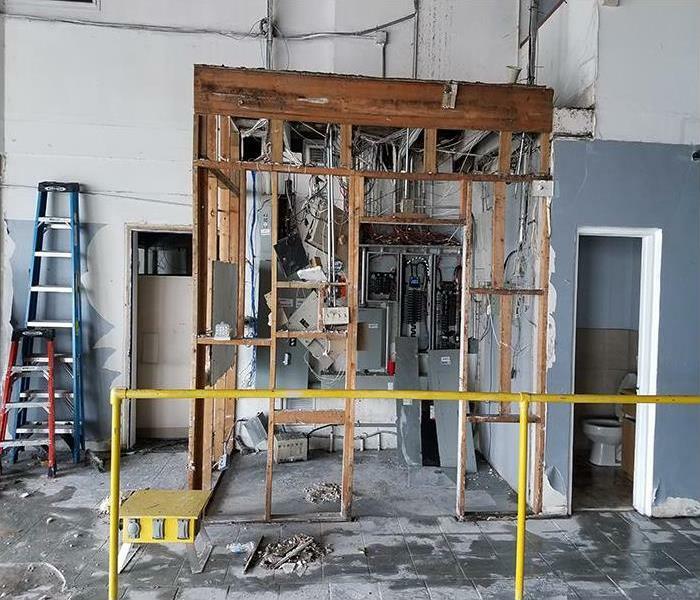 Commercial water damage occurred at this Chicago office when water line in the shared wall of the adjacent bathroom developed a leak. The source of the water leak would need to be located and repaired. The water on the floor would need to be suctioned up, and the drywall and baseboard required drying. These conditions are all in a day’s work for SERVPRO of Marquette Park / West Lawn / Ford City. A smoky oil fire in a Marquette Park garage can leave a messy residue that is also very odorous. 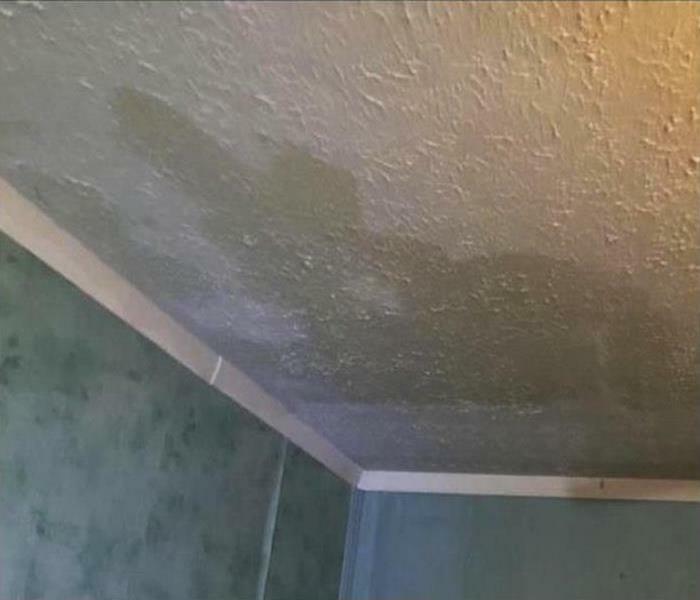 SERVPRO technicians can clean up the coatings on this wall and then spray an odor-retardant primer to further suppress the smells, even after the use of an ozone machine. Get it down professionally and quickly, call us. 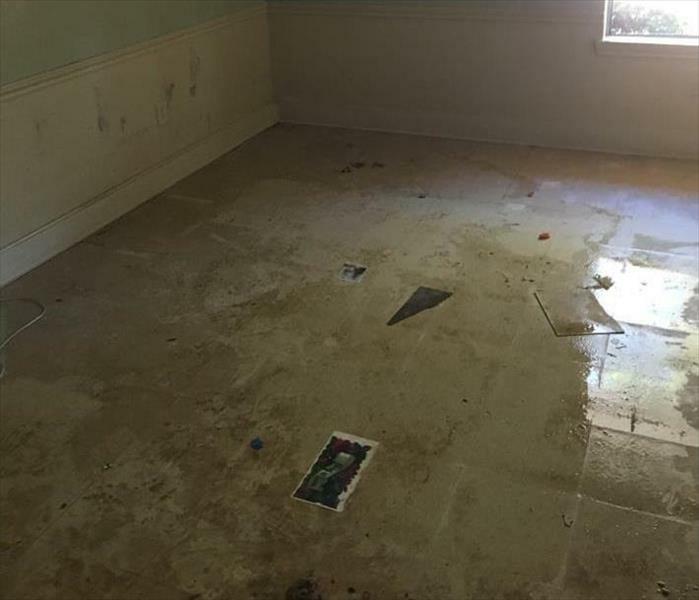 Water damage at this Chicago home saturated the carpeting and padding. There was a concern for the sub-flooring, and it was tested with hi-tech moisture detection meters that showed that the sub-flooring had absorbed too much moisture. 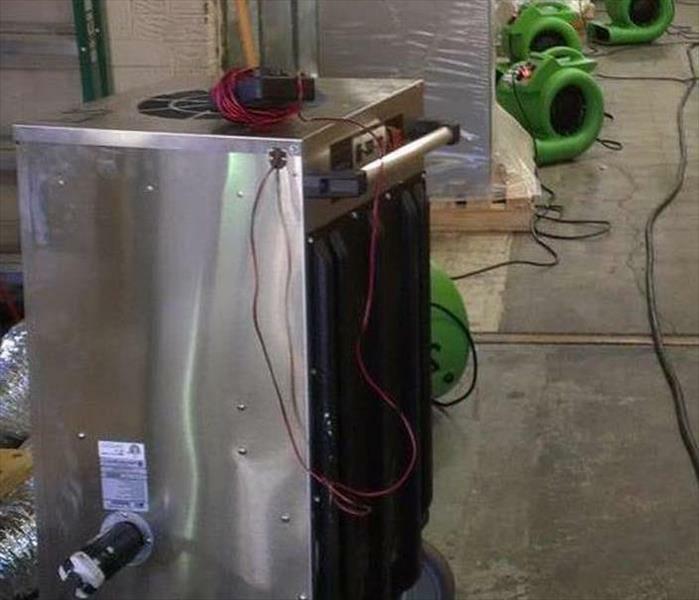 The carpeting and padding had to be replaced and then commercial air movers and dehumidifiers would be positioned to thoroughly dry the sub-flooring. 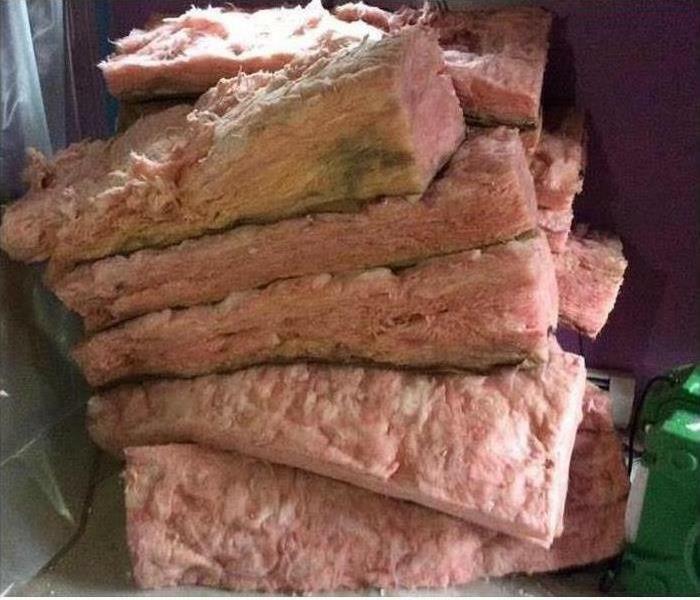 Mold damage struck this Chicago home when moisture entered through the roof of the home and settled in the attic insulation. 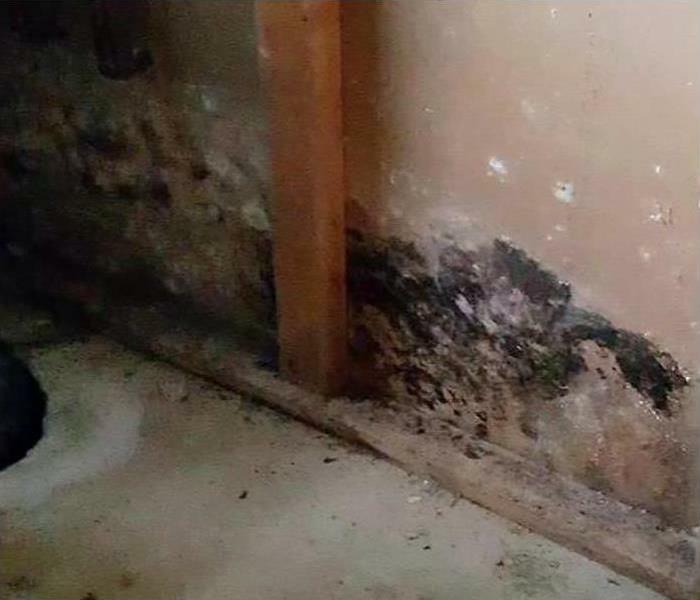 The combination of moisture and darkness is a perfect recipe for mold growth. The insulation would need to be replaced after thoroughly cleaning and drying of the attic. 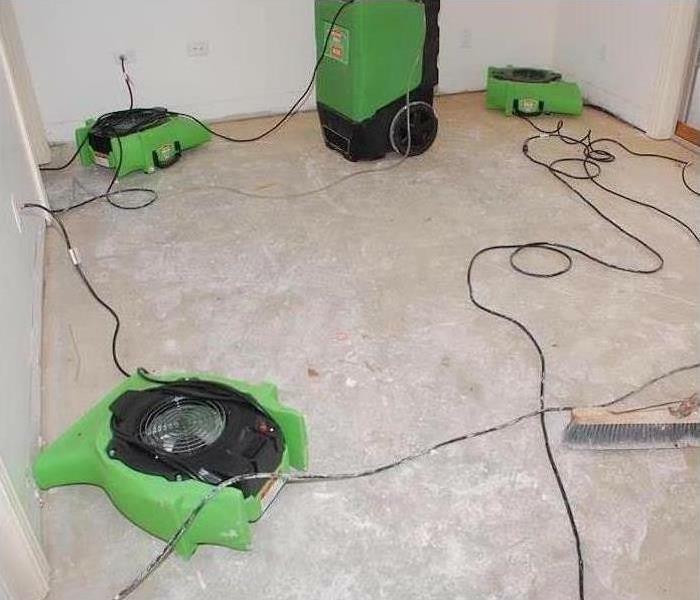 The water can be removed quickly from the Chicago commercial property if SERVPRO is called in for the extraction. This needs to be followed up with LGR dehumidifiers to make sure that the RH relative humidity is re-established down to normal levels for the comfort of all and to preserve furnishings. What should you do after your property experiences a fire? You need to contact a professional restoration company like SERVPRO for assistance. We have the specialized fire cleanup and restoration experience and training to restore your property to pre-damage condition. Our technicians also have the specific equipment and training for odor removal and deep cleaning of carpet and upholstery. We’re Faster to Any Size Disaster! 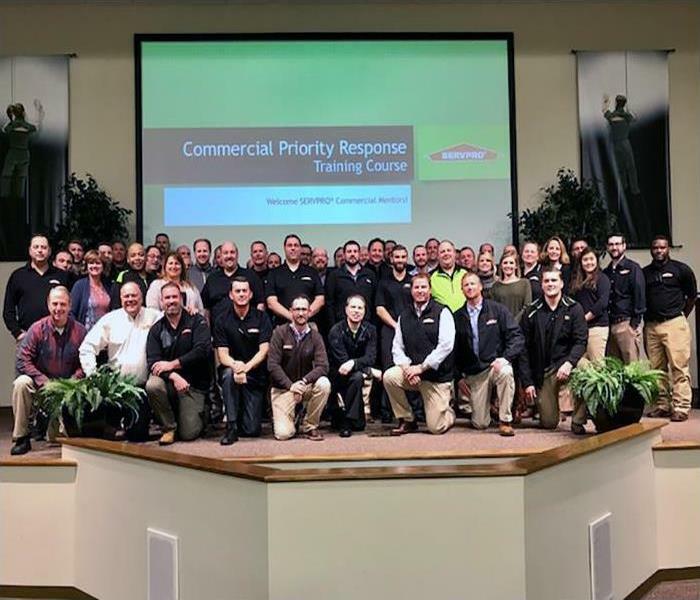 Pat and Frank Zubricki owners of SERVPRO of Marquette Park / West Lawn / Ford City participated in the Commercial Priority Response training at SERVPRO’s Corporate Training Facility in Gallatin, TN. Terry Murphy, Jose Chamorro, Ed Kowalski, and David Mason also attended. SERVPRO offers initial and ongoing training for all employees which will help us continue to provide excellent service to our customers. The wake of destruction left behind by Hurricane Irma is still piling up. This commercial building suffered significant flood damage. The flood waters were deep and had remained flooded for days. 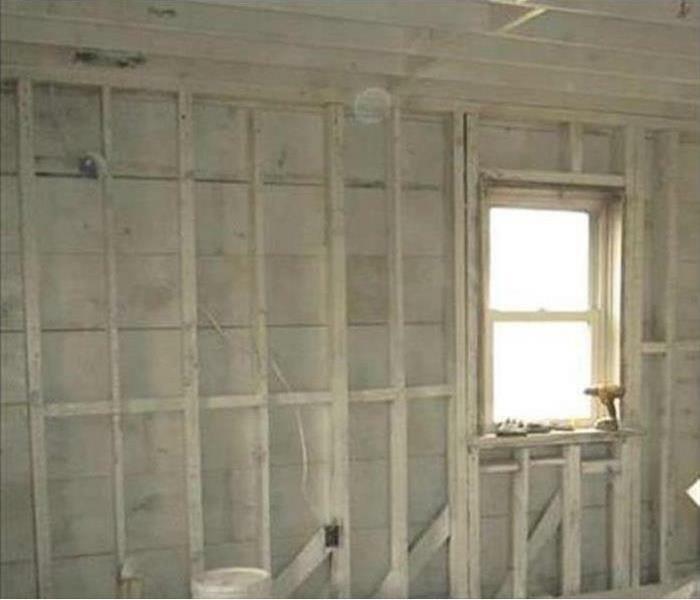 The drywall was damaged and needed to be removed. Our team is still in the demolition stage, and our next step is to begin the drying process. At SERVPRO of Marquette Park / West Lawn / Ford City, We’re Faster to Any Size Disaster! 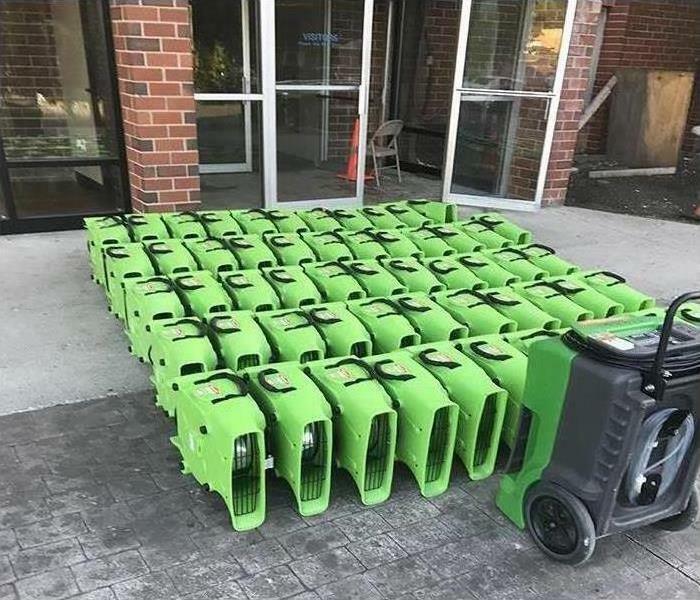 Our SERVPRO of Marquette Park / West Lawn / Ford City Green Fleet, a key component of SERVPRO's National Disaster Recovery Team, arrived quickly. Our crack crew helped coordinate a large-loss cleanup and restoration after Hurricane Irma had passed. 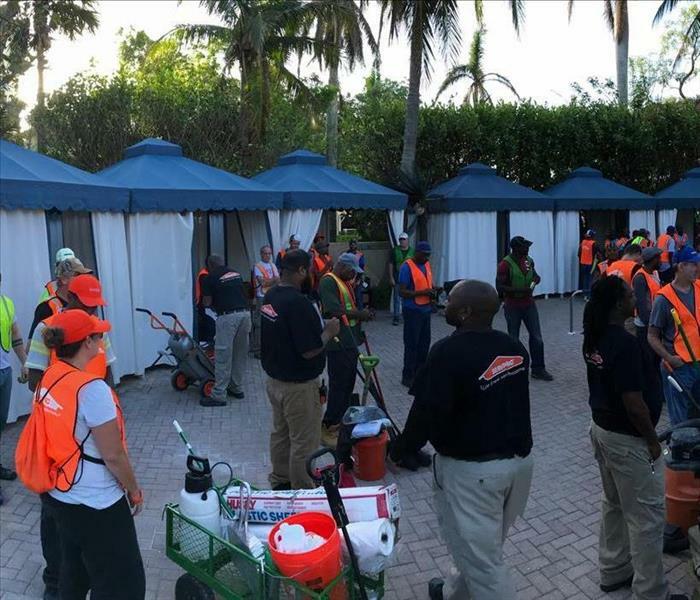 We utilized the talents of over 180 workers to extract water from over 60 rooms in the La Playa Hotel and Resort located in Naples, FL. We answered the call and labored over one month to make it "Like it never even happened." The devastation left by a fire can be overwhelming for you and your family. 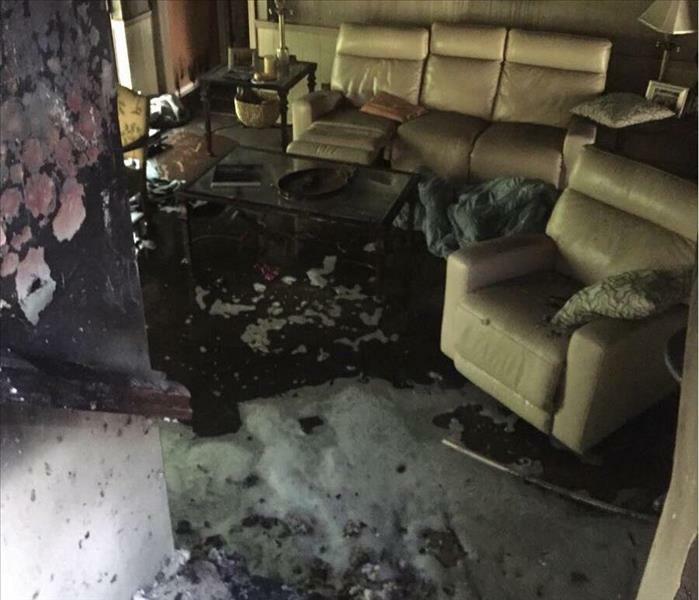 Your home can suffer from not only smoke and fire damage but also extensive water damage due to firefighting efforts. At SERVPRO we can take care of everything! We have specialized fire damage cleanup and restoration training and experience to restore your property to pre-fire condition. Our fast response will reduce your restoration cost and prevent further damage. Contact our experts today! 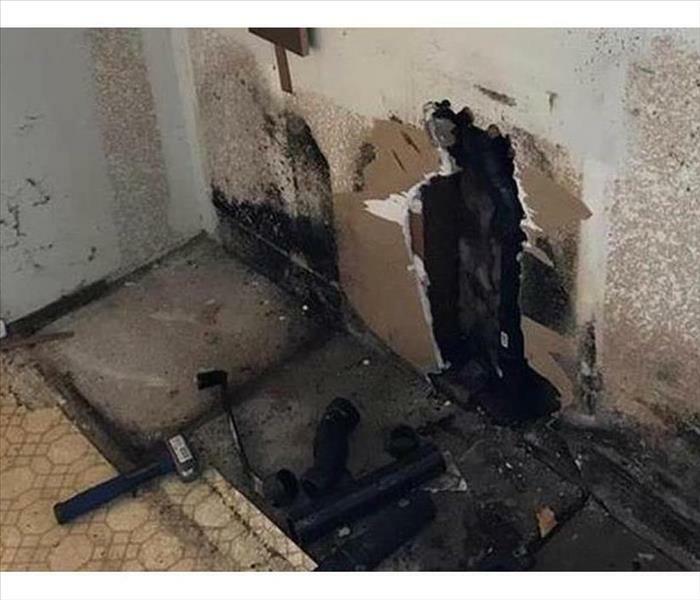 This kitchen leak led to a severe mold infestation needing safe remediation. 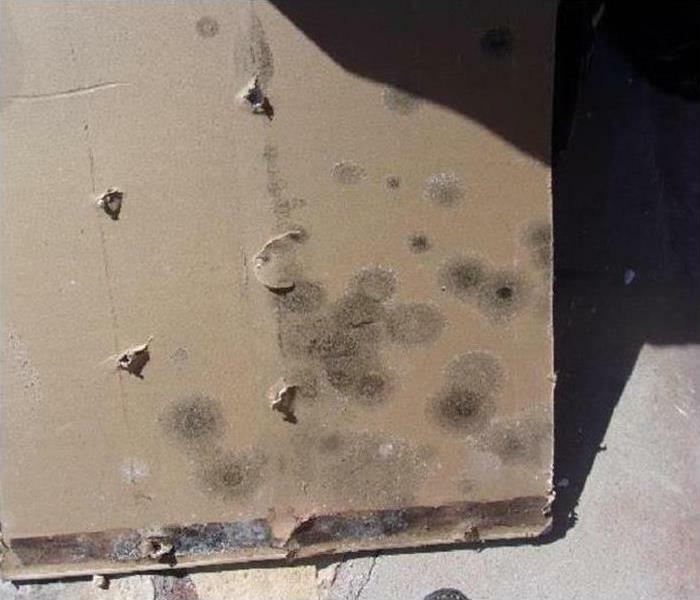 Professional removal of contaminated building elements from the cabinets to the walls can keep the mold spores from spreading to unaffected regions of this Ford City house. Get it done right by calling SERVPRO. 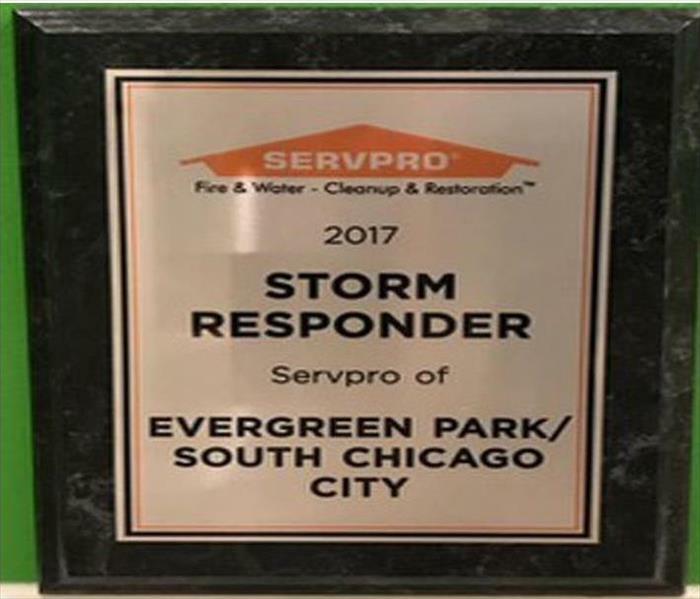 The Disaster Response Recovery Team from SERVPRO of Evergreen Park / South Chicago City answered the call for both recent hurricanes--Harvey in Texas and Irma in Florida. Led by owner Frank Zubricki and Large Loss Team Manager David Mason, a Green Fleet traveled to help our distressed neighbors. The Plaque is a thank you for our efforts. We're Faster To Any Size Disaster and proud to help. The water line in this storage area of a municipal building in Ford City flooded the area with about an inch of water. 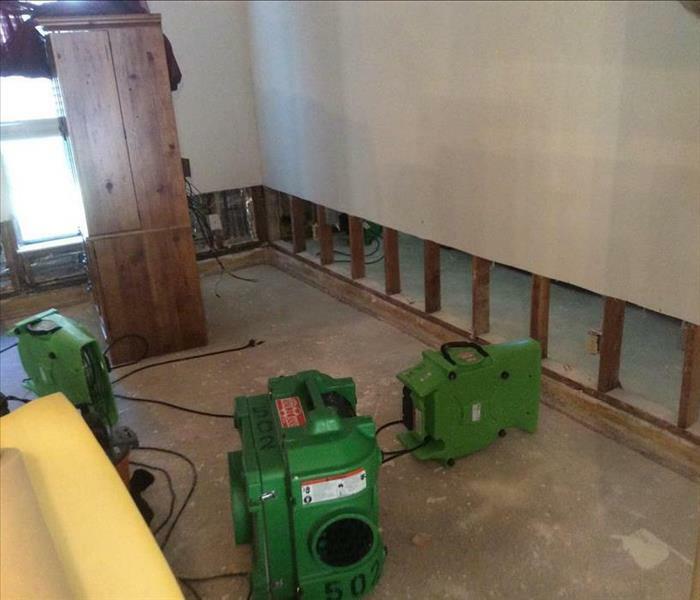 SERVPRO can quickly suction up and remove the water and then set up dehumidifiers and air handlers to restore normal moisture levels. 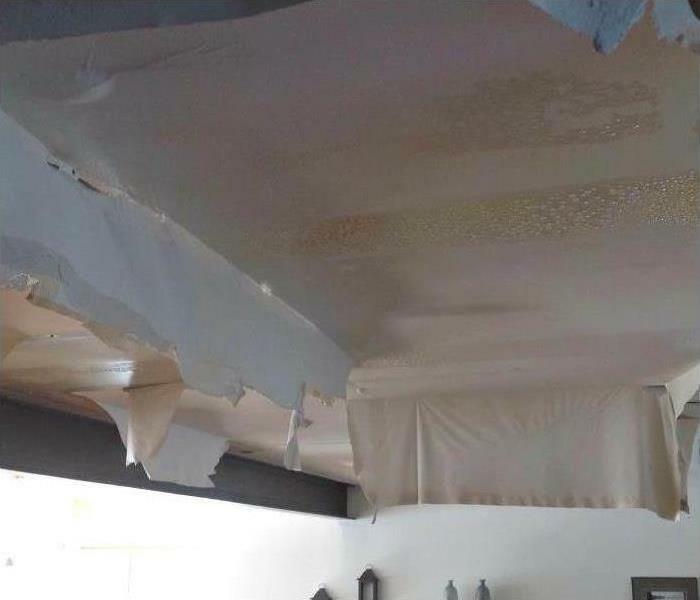 Water damage to this Chicago home’s living room ceiling and the wall was the result of a pipe that burst in a second-floor bathroom. The homeowners were away for the weekend, so the water had been running for some time. 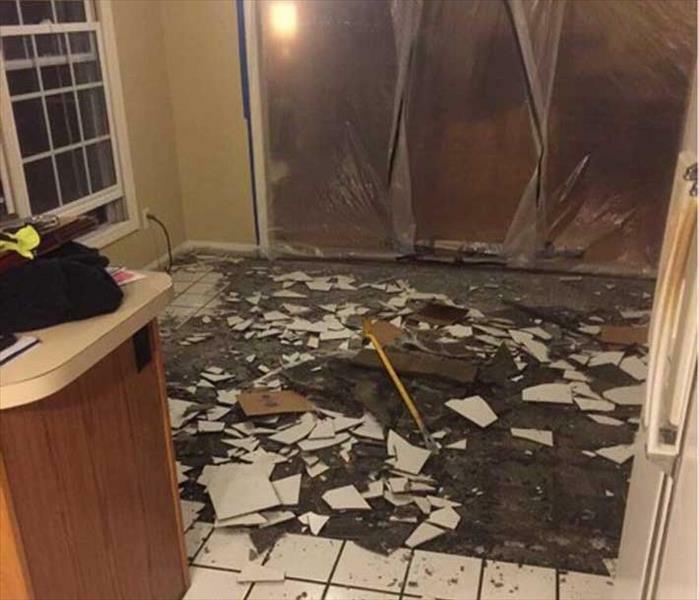 The photo shows just how serious this water damage was. The stormwater pushed through the broken window dumping water on the vinyl flooring in this Marquette Park room. The tiles lost their adhesion and lifted from the subfloor. 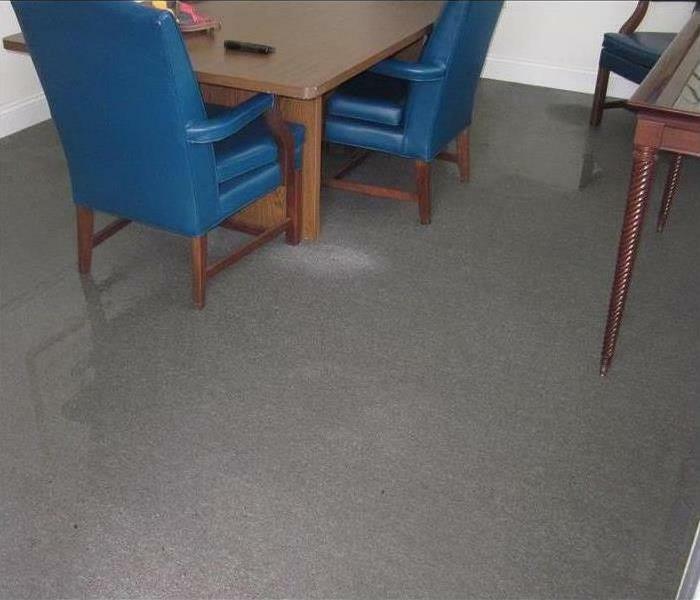 Our SERVPRO crew removed the pooling water to limit the storm damage to the floor. A fast response saved our customer a lot of money and additional troubles. 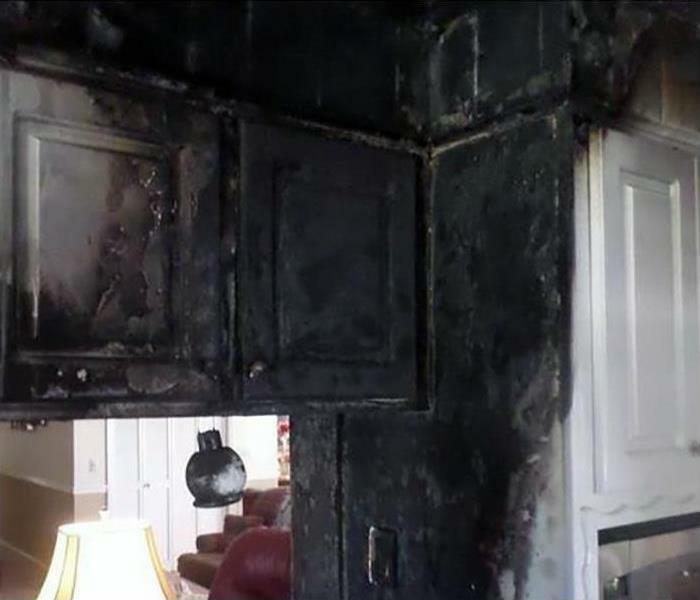 Fire damage in this Chicago kitchen produced the soot and smoke damage pictured in the photo. 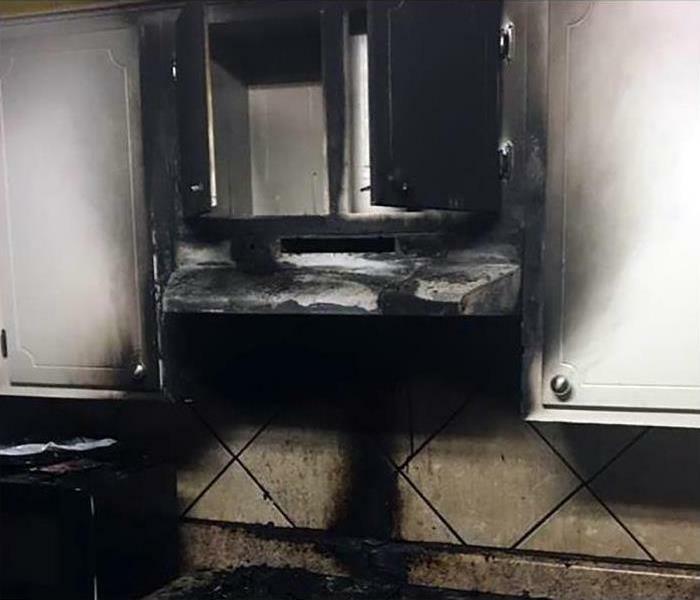 The fire was a small grease fire on the stove, but it produced a large quantity of smoke. We used tried and true SERVPRO products and procedures to remedy the situation. The SERVPRO of Marquette Park / West Lawn / Ford City team was proud to assist in the Hurricane Harvey response. We have the experience and equipment to respond quickly to hurricanes and floods. Our highly trained professionals use advanced techniques to quickly restore commercial or residential properties to pre-storm condition. 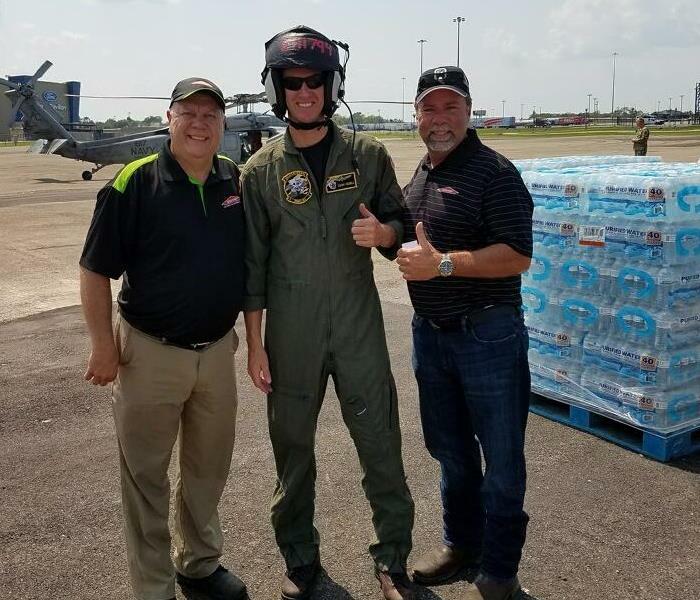 In the photo, Frank Zubricki and Dave Mason from SERVPRO greet one of the many rescue pilots who also responded to help local residents. 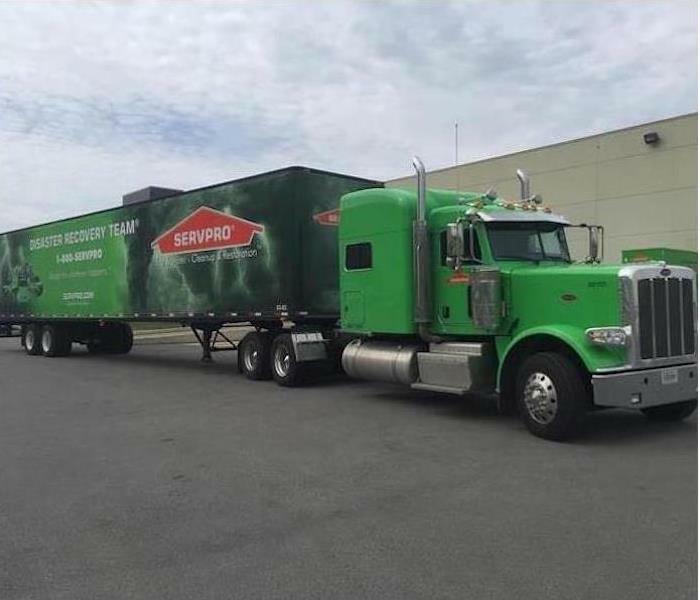 Our SERVPRO crews have been loading our Green Fleet of vehicles with emergency supplies for our distant neighbors suffering from the effects of Hurricane Harvey. We are transporting consumable products, foods, and many cases of bottled water. These supplies can help sustain those in need of the necessities of life. We are also carrying industrial grade equipment and chemicals to combat the storm damage to residential, business, and support structures. These three determined crew members are preparing this Green Box Truck for departure to Texas. Just as we consider our crew our family, we feel the same about our fellow countrymen and women. The mold infested room of this older home in Ford City has been isolated from the remainder of the non-mold infested rooms of the structure. This prevented mold spores, dust, and a general mess from migrating and infesting new areas. The demolished and discarded building elements expose surfaces for the antimicrobial spray by our SERVPRO AMRT crew. 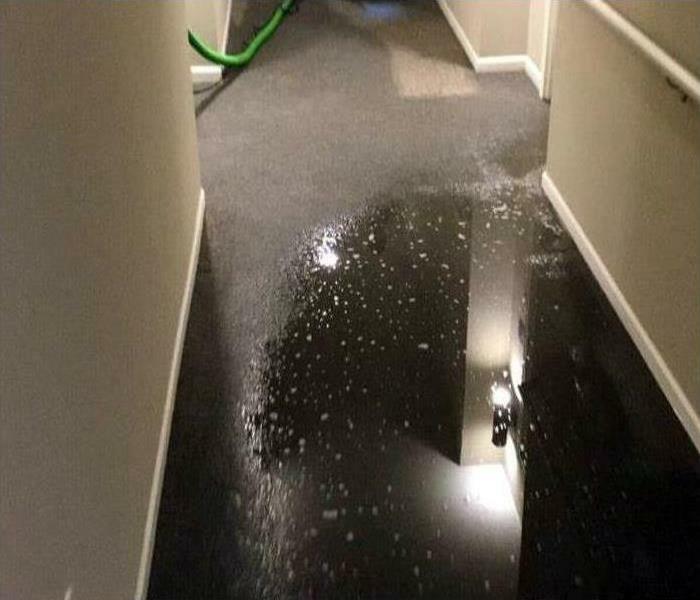 Water damage was discovered at this Chicago office upon the arrival of the office manager. 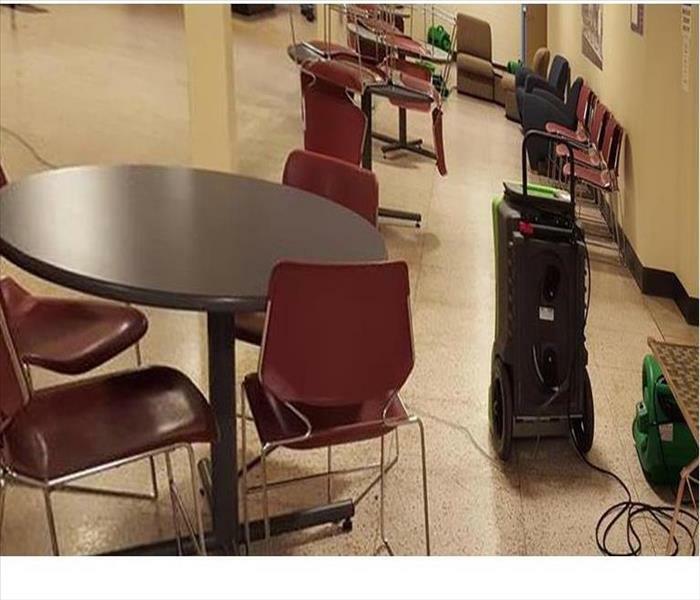 The manager immediately called SERVPRO of Marquette Park / West Lawn / Ford City for help in cleaning up the water and drying the carpeting and furniture. We responded quickly and began extracting the water from the commercial grade carpeting. 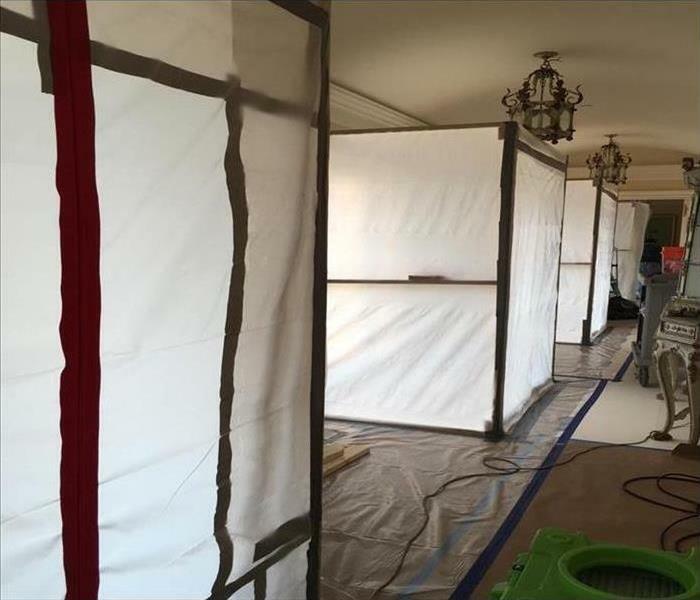 We used commercial air movers and dehumidifiers to aid in the drying process. The storm water lifted up the tiles on this floor in Marquette Park. The open window allowed the water to enter in this one area of the breakfast nook. The main wing of the house is sealed off to prevent the dust and debris from the demolition from harming unaffected areas of the storm. Neat and clean, that is the SERVPRO way. 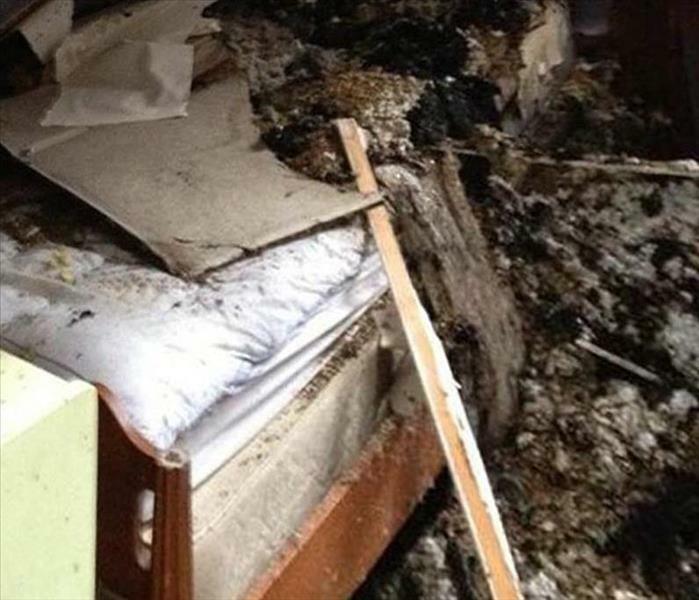 This badly fire-damaged home in Chicago was the result of a tipped over space heater. Our SERVPRO crew arrived quickly to remove the charred debris. We also set up equipment to eliminate the noxious odors from the structure. 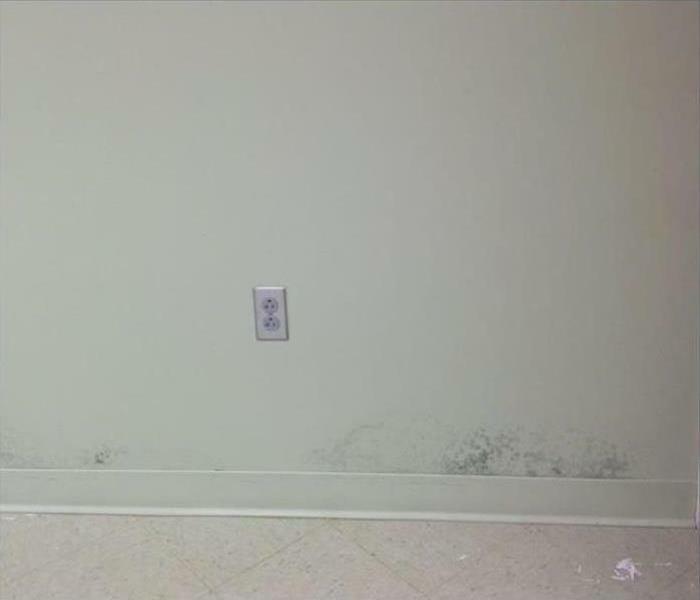 Mold damage in Chicago not only needs to be treated, but the remainder of the building needs to be protected while the cleaning takes place. 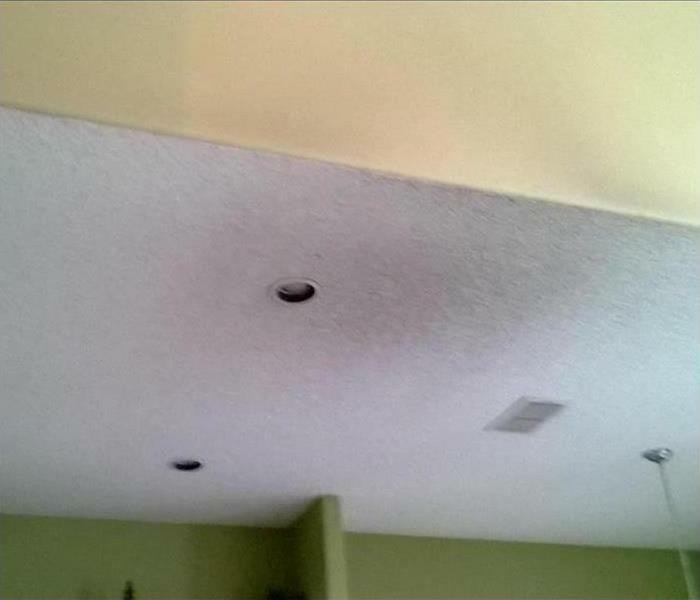 This photo is an example of containment areas built by SERVPRO technicians top contain any mold spores when cleaning. Because of manufacturing plants that contain large amounts of paper products, the water removal process is of paramount importance. 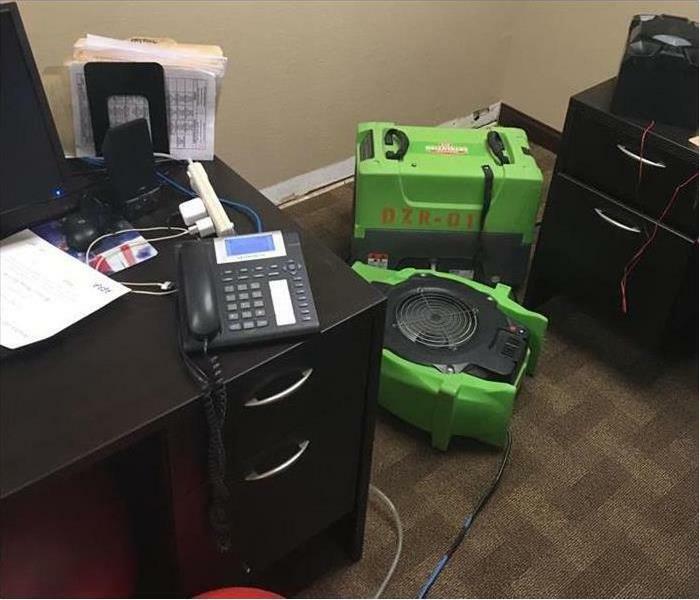 SERVPRO technicians extract the visible standing water, but of equal importance is the strategic placement of dehumidifiers and air movers to restore a normal relative humidity to the structure. Count on us for rapid service to preserve your business. Ongoing training is our commitment to you. 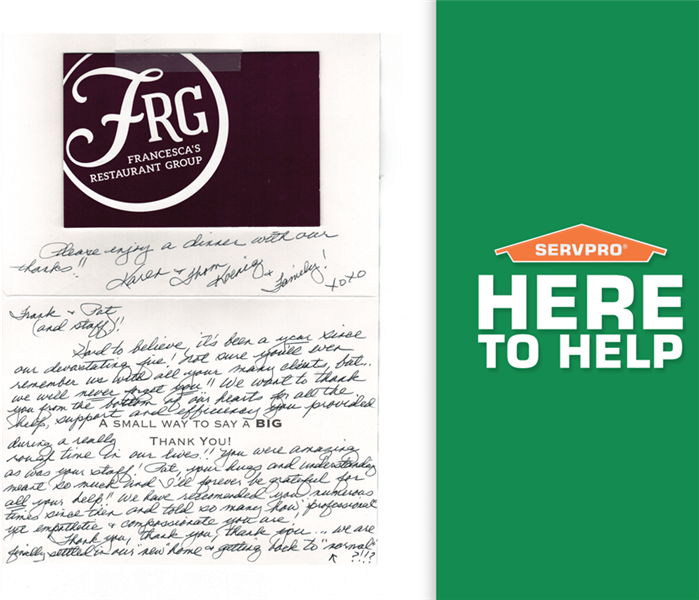 SERVPRO developed the National Training Center in 1992 to teach restoration skills to franchise employees. Team members from SERVPRO of Marquette Park / West Lawn / Ford City including (pictured left to right) crew chief Bob Pape, Ana Perez, Liz Sanchez and operations manager Terry Murphy went to the Training Center for ongoing Large Loss Response Team training. The purpose of the LLRT is to have Franchises pre-qualified to handle Large Losses for the Commercial Large Loss Division. SERVPRO® has Insurance clients requesting that we compile a list of qualified Franchises that will work under a pre-arranged set of criteria. As a trusted leader in the restoration industry, our team can help you recover from a commercial or residential water, mold or fire emergency in the Chicago area. 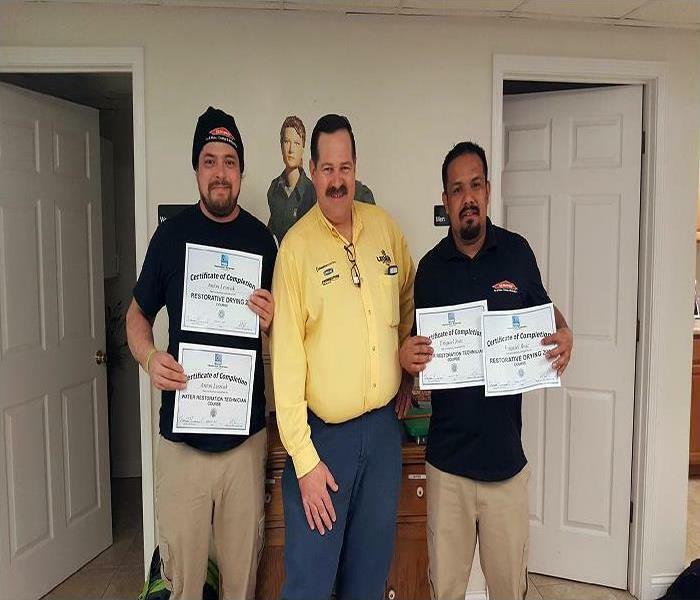 Recently our production Crew Chiefs Anton Lesniak and Esiquiel Ruiz visited Peoria Illinois for ongoing training for water restoration technicians and restorative drying training. Our local Chicago area staff is highly trained in property damage restoration. From initial training to regular IICRC industry certifications, we have the training, equipment, and experience to help our residential and commercial customers recover quickly after an emergency. Certification is awarded after successful completion of course materials and an examination. 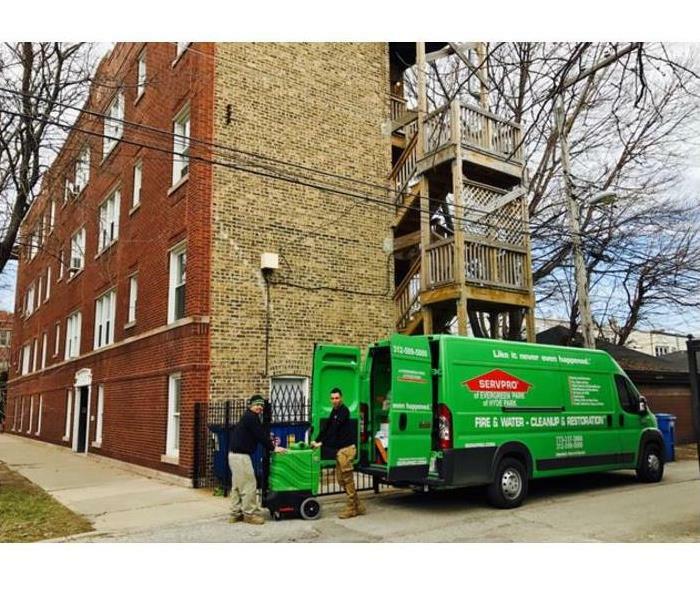 The team at SERVPRO of Marquette Park / West Lawn / Ford City is committed to ongoing training to help you recover from fire, smoke, water or mold damage in the Chicago area. 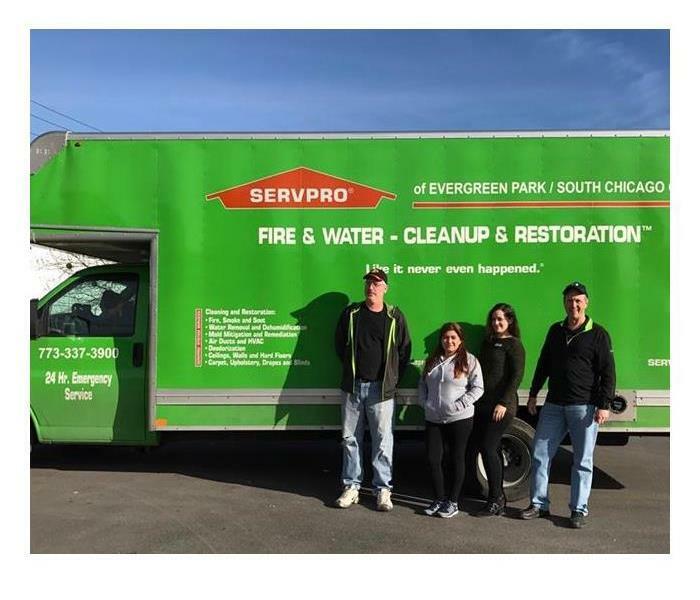 Our SERVPRO of Marquette Park / West Lawn / Ford City team is proud to help our customers recover from unfortunate fire losses. Needless to say we were very happy to receive a thank you note from a customer we worked with over a year ago. It was the morning of Valentines Day 2016 when we received a call from the insurance agent alerting us to the residential fire. Later that morning we sat at the family dining room table to discuss the challenges that lie ahead. The smell of fire was still on their clothes and in the air. We always try to treat our customers like family. That morning, we became family. 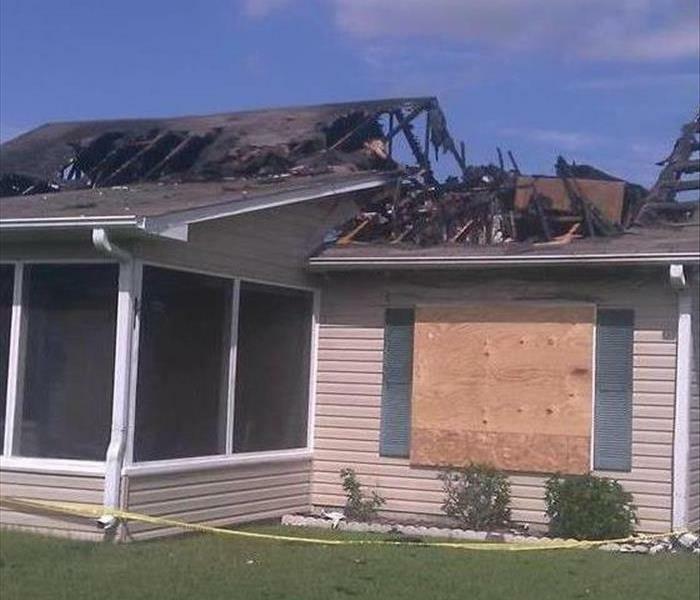 Fire damage to a family home or business can be a very stressful event. For more information on fire damage restoration in the Chicago and Ford City area, call us for professional service. 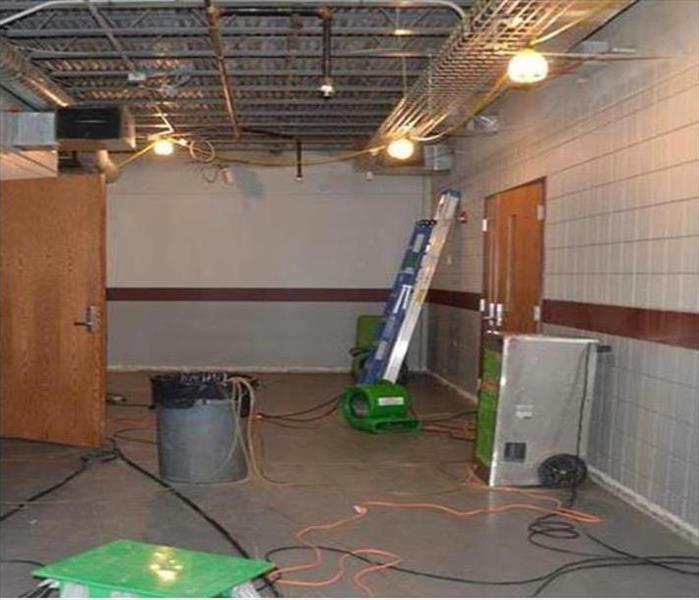 Commercial water damage can come in large sizes in Chicago. 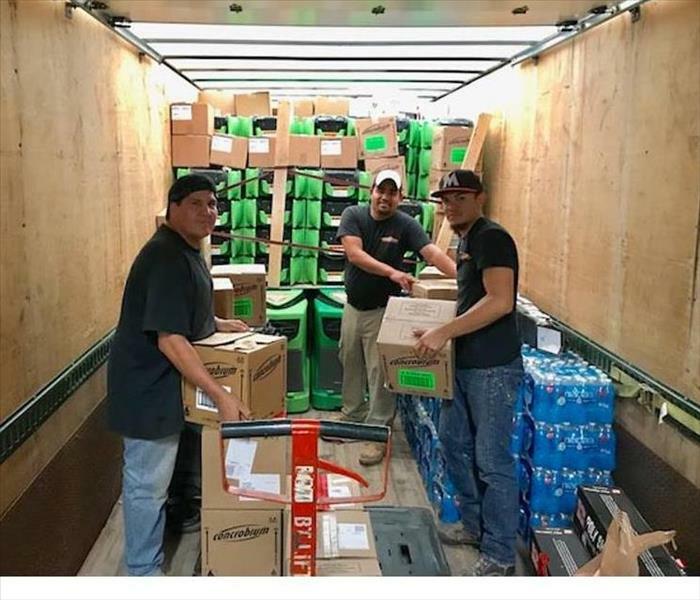 SERVPRO of Marquette Park / West Lawn / Ford City has large quantities of water damage restoration equipment loaded and ready to respond on a moments notice. SERVPRO developed the National Training Center in 1992 to teach restoration and mitigation skills to franchise employees. Our Production Manager Jose Serna along with our Crew Chief Esiquiel Ruiz are heading to SERVPRO Corporate in Gallatin TN for ongoing Large Loss Response Team training. The purpose of the LLRT is to have Franchises pre-qualified to handle Large Losses for the Commercial Large Loss Division. SERVPRO® has Insurance clients requesting that we compile a list of qualified Franchises that will work under a pre-arranged set of criteria. Participating, qualified Franchises will be required to work under the terms of a participation agreement. Our local team is ready to help you recover from a residential or commercial water, mold or fire emergency in the Chicago area. 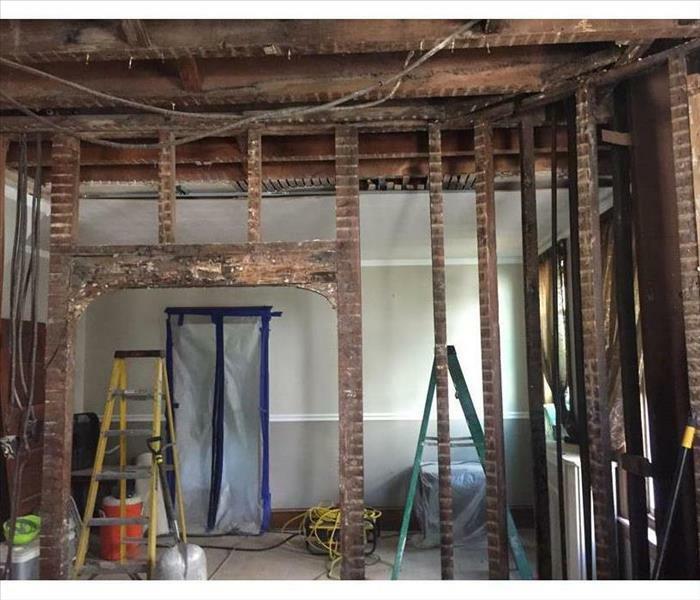 Our SERVPRO team extracted the water from this damaged home, moved furnishing to preserve them, and cut out the damaged drywall to treat the framing and also to prepared the opened walls for new installation and total rehabilitation. 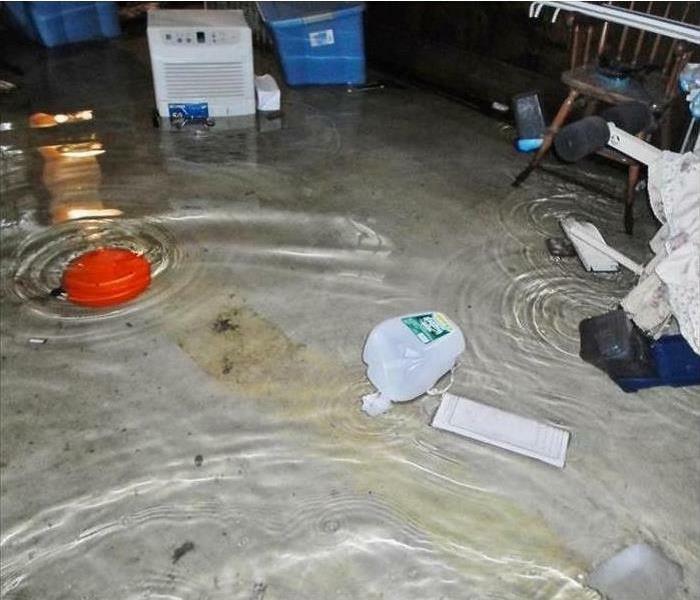 Two inches of water means we get out the sump pumps and heavy duty extractors to limit the damage to this Chicago garage. Since the loss of stored belongs was not a primary concern, we immediately started the extraction to preserve the walls and infrastructures. This small rental property had a large attic fire. Our job was to secure the possessions by keeping out vermin, vandals, and bad weather. It was a crime scene, so we had to wait until the authorities completed their investigation before proceeding with the fire damage clean up. 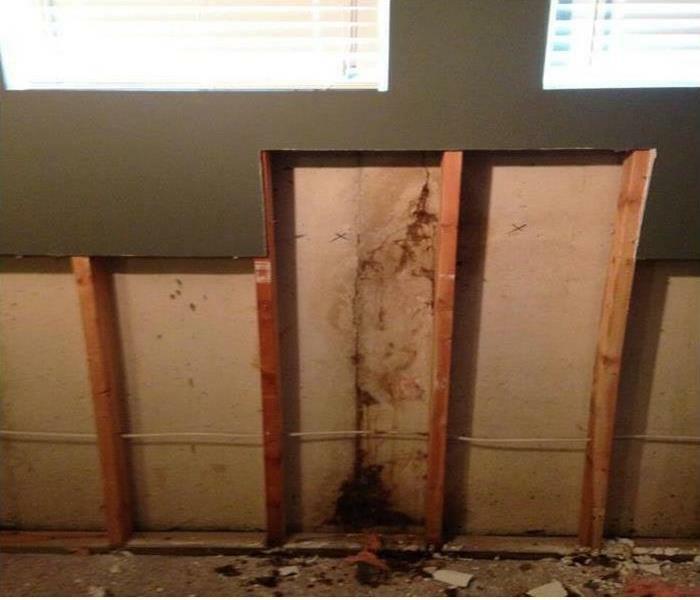 The mold in this frame home developed from an exterior seepage of water through the siding. The dormant mold spores sprung to life and emitted that foul, musty odor. We cut out and discarded some of the drywall panels, and then began the antifungal work.